The most anticipated event risk this week is the ECB’s monetary policy decision on Thursday and the euro has rallied strongly ahead of the announcement. For the first time in 2 years, the ECB is expected to raise interest rates. Having brought rates to a record low of 1.00 percent, Trichet has made it clear that a 25bp rate hike is needed to avoid a further rise in inflation expectations. Recent comments from ECB officials have been very consistent and a 25bp rate hike has been completely priced into the market. In fact, traders are pricing in a 50 percent chance that interest rates will be increased by 50bp. We believe that a half point hike is extremely unlikely given how central bank officials have stressed the need to raise rates gradually. It would be smarter for the central bank to split this up into two separate moves than one large move there is little reason for the ECB to act quickly, let alone aggressively. What is more likely however is that the ECB raises rates and then signals the need for further tightening in the months to come. 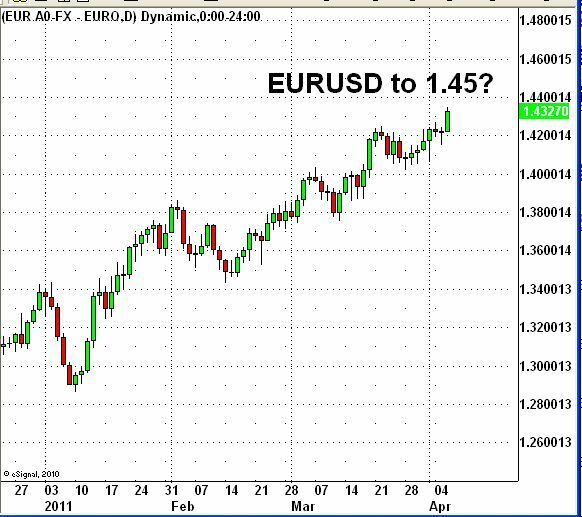 The strength of the euro indicates that investors expect hawkish comments from the ECB. Should ECB President Trichet disappoint by downplaying the need for further tightening, the euro could come crashing down because the only thing holding it up is rate hike expectations. Despite continued downgrades by rating agencies and the earthquake in Japan, the ECB still believes that normalization needs to begin now. As a result, we expect the euro to remain strong going into Thursday’s announcement but the reaction to the rate decision could be less favorable. How the euro responds to the rate hike depends on what ECB President Trichet says at 8:30 NY Time. If he indicates that this is a one off rate hike, investors could end up selling euros but if he signals that they will continue to tighten in the coming months, then not only could the EUR/USD sustain its gains, but it could extend to 1.45.